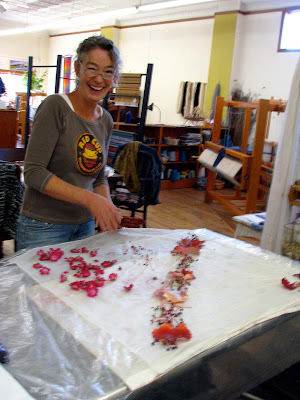 We had the good fortune of having Michelle Workowski of the Nature of Things, do a natural dye class at Kindred Threads during the Driftless Studio Tour in November. The surprise element of natural dyeing is half the fun, the results are pretty unpredictable. 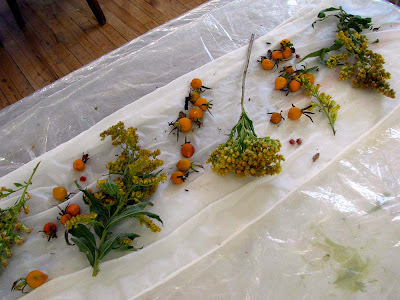 We used damp silk scarves and laid out an assortment to natural dyestuff. 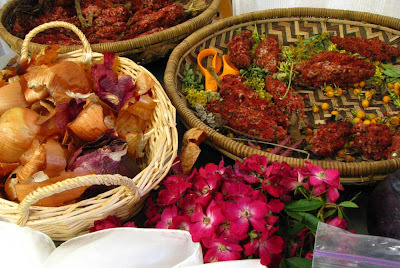 Everything from onion skins, goldenrod, tansy, elderberries, red cabbage, wild coffee, willow leaves to parprika and tumeric. We then wrapped the scarves up tightly, with the dyestuff trappind inside and used copper wire in a spiral around the scarf roll to hold everything together and more importantly to act as a mordant to make the dyes permanent. 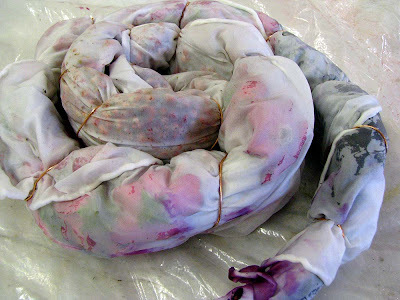 Then each scarf went into a baggie with about 1/2 cup of vinegar and was set in a sunny window for about one month. It was hard to wait to see the results but worht it. I will share the finished results in my next blog entry. 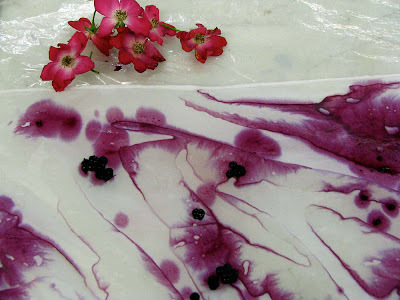 This looks like such a fun way to approach natural dyeing! I’ll have to keep this technique (wrapping in copper for the mordant) in mind in my Shibori class this winter! When I go into the studio I will see if I can find the full directions. We wrapped some things with steel wire and that seemed to work also. We may have left some of the scarves in the vinegar too long because in places the wire ate trough the scarf. So experimenting is key.